One of the challenges of picking in a freezer, where it is sometimes 20°F below zero, is the reality that the picker is wearing thick gloves. This makes it more difficult for them to use paper and pencil or RF scanning devices. With Voice-directed picking solutions, workers speak confirmations so that their hands are free to execute their picking tasks with optimal speed. 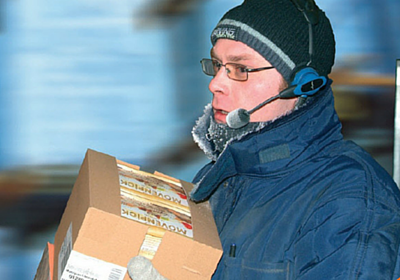 To make matters even more challenging, frozen food items often have varied catch-weights that need to be recorded during the picking process for accurate customer billing purposes. Voice-directed picking solutions make this process much faster, more accurate and more cost effective. With voice, workers don’t have to stop to write down the catch weights which later need to be read and keyed into the host system by an administrator. The picker can simply read and speak the catch weight when prompted as the product is being picked. The catch weight is recorded by the voice system which automatically updates the host system. This process eliminates opportunities for errors and is much more efficient. Beyond making your existing pickers optimally productive and accurate, voice picking solutions have an additional important benefit which helps with the inevitable employee turnover that occurs with freezer pickers: dramatically reduced training times for new employees. As an example, Perry's Ice Cream reduced the time it takes new employees to hit required efficiency targets from 90 days (long because they had also had to memorize product locations prior to implementing voice) to just 5 days. Other companies report learning curve times being reduced from days to just hours with voice. So, take the first step toward bringing all the benefits of a Vocollect Voice picking solution to your freezer distribution center operation. Contact Speech Interface Design to schedule our complementary on-site “Industrial Engineering-strength” Value & ROI analysis.